Unfortunately, we no longer carry this bag. This page is available for informational use. Since this bowling bag Is no longer available, find more bowling bags On our bags page. This bag easily holds 2 bowling balls and a pair of shoes. With premium YKK luggage zipper and a see through compartment top, you can carefully see which balls you have in your bag and with easy access can adjust them before going to the lanes. Made with 1680D fabric and an adjustable padded shoulder strap. 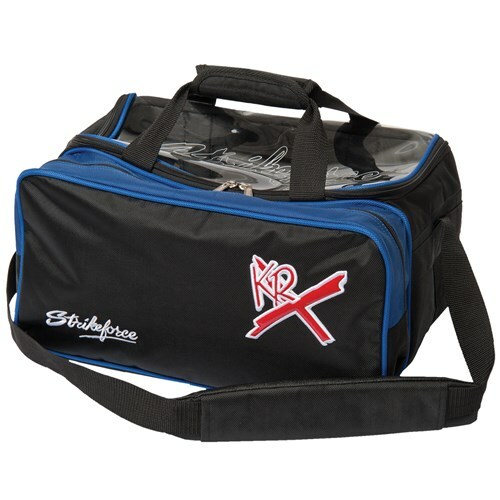 Due to the time it takes to produce the KR Strikeforce Royal Flush Double Tote w/Shoe Pocket ball it will ship in immediately. We cannot ship this ball outside the United States.